Pakatan Harapan has finalised its coalition logo and leadership structure, after months of negotiations. PKR de facto leader Anwar Ibrahim will be the coalition's de facto leader while Parti Pribumi Bersatu Malaysia (Bersatu) chairperson Dr Mahathir Mohamad will be Harapan chairperson. The decision was announced by Mahathir at a press conference following the coalition's meeting at the PKR headquarters in Petaling Jaya, just after midnight today. 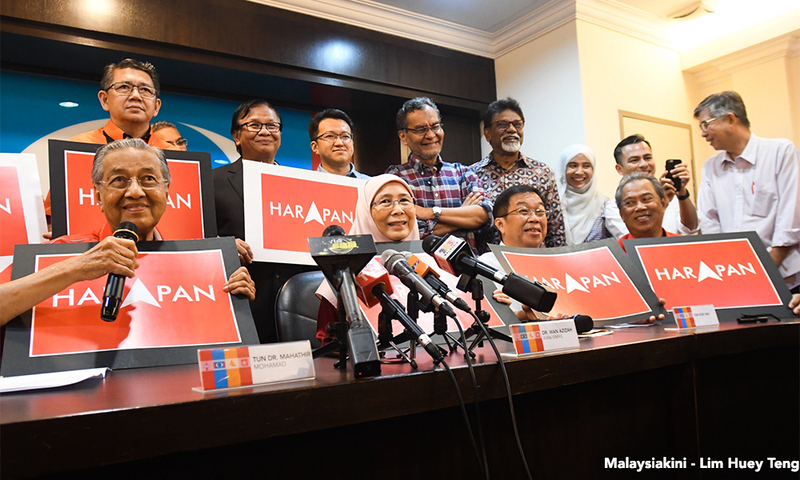 He was flanked by Harapan party leaders, each holding the coalition's new logo. Mahathir said the coalition will finalise other details in its constitution before submitting its registration to the Registrar of Societies (ROS) in about a week's time. Harapan was supposed to have finalised its structure months before, in order to register the coalition with the ROS. However, the decision was postponed in order to obtain feedback from Anwar over Bersatu's proposal. Bersatu had reportedly made concessions, agreeing that Wan Azizah would be the president of Harapan instead of Muhyiddin. However, Bersatu was adamant that Mahathir should be made chairperson. Asked if this means Anwar will be the coalition's prime minister candidate, Mahathir said a pardon process will be pursued by the coalition once it comes into power. There will be an interim prime minister before Anwar, he said, because the legal process for Anwar to re-enter politics could be a long one. Asked who will be the interim PM, Mahathir said an announcement will be made later. "We will announce who the seventh PM will be, but today we will only announce the eighth one," he said.